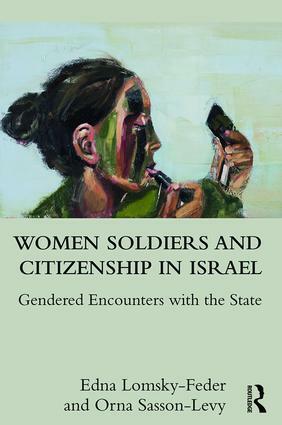 Women’s military service in Israel presents a compelling case study to explore the meaning of gendered citizenship. Lomsky-Feder and Sasson-Levy compellingly argue that women’s mandatory military service during an active ongoing violent conflict, occurring at a formative age, becomes an initiation process into gendered citizenship, where the women learn their marginal place in relation to the state. By analyzing the life stories and testimonies of young women from varied social backgrounds, the authors ask: How do young women soldiers manage their expectations vis-à-vis the hyper-masculine military institution? How do women experience their gendered citizenship as daily embodied and emotional practices in different military roles? How do women soldiers understand and cope with daily sexual harassment? And finally, how do women cope with the gendered silencing mechanisms of the violence of war and occupation, and what can women soldiers know about this violence when they choose to speak out? The book offers a new conceptualization of citizenship as gendered encounters with the state. These encounters can be analyzed through three interrelated concepts: Multi-level contracts; Contrasting gendered experiences; Dis/acknowledging the military’s (external and internal) violence. Applying these three thought-provoking concepts, the authors depict the intricate, non-deterministic relationships between citizenship, military service and multiple gendered experiences. Edna Lomsky-Feder is an Associate Professor at the Department of Sociology and Anthropology and at the School of Education, The Hebrew University of Jerusalem. Her research interests include memory and nationalism, war and military, and personal narratives. Her work has been published in journals such as Sociology, Ethos, Armed Forces & Society, and the British Journal of Sociology. Orna Sasson-Levy is an Associate Professor in the Department of Sociology and Anthropology and the Program in Gender Studies at Bar Ilan University, Israel. Her research interests include militarism and gender, new social movements, and Israeli ethnicities. She has published in journals such as Gender & Society, The Sociological Quarterly, and the British Journal of Sociology.